You, my lightning in the soil! This is a newer painting that I’ve been looking at for a while now here in the studio. With its many lightning bolts, it’s obviously different from most of my work even though most of it falls in line with the body of my work. Most of my considerations have to do with whether I feel there is more to be done on this piece. That’s not uncommon when a new element is added. It takes time for me to accept this new thing being interjected into my quiet little world. I guess that can be said for most new things. I can see where a lot of people who know my work might have mixed feelings about this piece that seems so much like an anomaly. It has a feeling of an electrical shock in it, shiny and sharp and harsh. If you’ve ever been zapped by a strong jolt of electricity, you know what I mean. But for now, I continue to consider this painting. It may change in some way before it ever sees the outer world again. Or may be not. 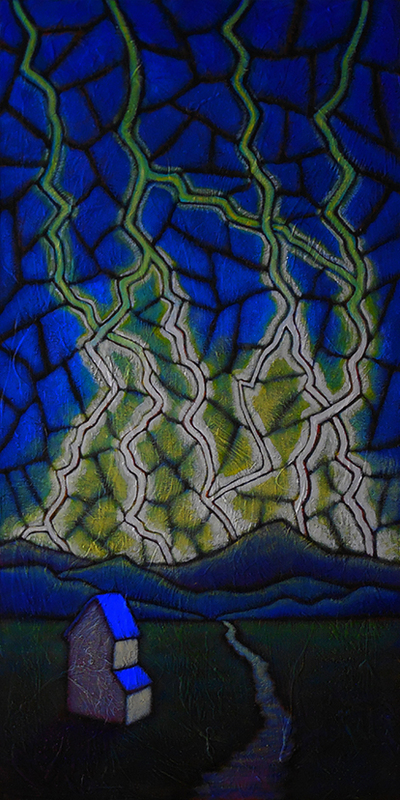 For now, I am calling it Sowing Lightning after the poem at the top from the Albanian poet Visar Zhiti. The idea of lightning planting itself in the earth with each strike is an intriguing one.